But of course you didn’t. You continued to learn about other abominations–the cruel weaning rings that prevent calves from nursing; surgical dog devocalization; fox and coyote penning–and so much more. Again and again you’ve adjusted your schema to accommodate new knowledge and, in doing so, have come to understand just how far your species is willing to go in its use and abuse of other animals. If you’ve been an animal rights activist for any time at all, you know this sad pattern all too well. 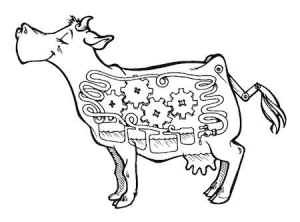 Once the cannula is surgically placed in the cow, the animals grazes [sic] for a set period of time before being examined. Farmers remove the plug and pull the grass and oat mixture from the rumen. This material is collected and tested, and this analysis shows farmers and researches [sic] which forages get the best results from the livestock, based on how much is digested. Cannulated (also called fistulated) cows are not a new phenomenon and might not even be new to you. But me? I was stunned–and horrified. It was debeaking all over again. With schema newly adjusted, I learned that this procedure has been in use since the 1920s with even earlier instances occurring in the 1800s. Cannulation is all about optimization: determining the optimal feed optimizes livestock production for optimal profit. It’s not all work and no play at Darr Ranch, though. …there is a day when students get to come in with any food items, ranging from Snickers bars to Twinkies. Students get to place these food items inside the steer and observe how long it takes for the cow to digest each of the items. Though it’s hard to fathom how tossing highly-processed Golden Sponge Cake with Creamy Filling down the rumen hatch advances science, the caper does have the air of a fifth grade science fair project. And speaking of kids, AnimalSmart.org’s Kids’ Zone provides a page titled, “What is a fistulated cow?” in its Jr. Animal Scientist E-News. AnimalSmart.org was launched by the American Society of Animal Science (Mission: …the responsible use of animals to enhance human life and well-being) two years ago to inculcate kids with the dogma of speciesism (e.g., see “Humane Harvest” and “Why eat animal products?”). Using science to legitimize and sanitize animal exploitation, Big Ag recruits ‘em early and often. Justifying this horrifying experimentation is straightforward: It doesn’t cause pain. It allows researchers to analyze digestion and determine the best livestock feed. It has therapeutic value: rumen liquid from healthy, cannulated cows can be removed and pumped into sick cows whose beneficial digestive bacteria have gone missing. Never mind that it’s all about producing products–meat, milk–that humans don’t need. Professor of agricultural practices at Kansas State’s College of Veterinary Medicine says – without any irony whatsoever – ”We like to think of Fertis (the college’s cannulated steer) as saving as many cattle as we do in the state of Kansas.” Saving for what? goes unaddressed, but the slaughterhouse and dinner table are always just around the corner. Watch Fertis the Fistulated Steer: Revealing the Rumen at Open House. But it’s OK, "because it doesn’t hurt and we give them hand-picked names."